Coding is essentially learning how to tell something to do something, right? 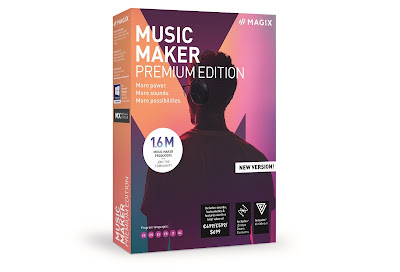 In the past we've explored a few products designed to get kids into coding, including the Kano and the DIY Gamer Kit. But how about making coding even simpler and removing the computer screen all together? That is what Cubetto is all about. Cubetto, from Primo Toys, is a language-free coding toy that lets children see the physical results of their actions immediately. No keyboard, no computer screen, and no special codes to learn; everything is made from chunky plastic and wood and is essentially a tactile way to get them thinking about programming. 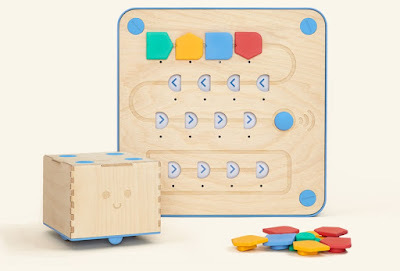 In the box is Cubetto himself, a cuboid robot made mostly from wood, the control panel, again a mixture of plastic and wood, a bag of programming blocks, and a playmat. Once batteries are in both the robot and the control panel (you need six AA) you are ready to start. Simply drop the command pieces into the slots on the panel, hit the button, and Cubetto will follow those commands in order. So, drop in forward, right, forward, left, and the robot will follow that exact sequence. This you can let him do just free on the floor or a table, or for more of gaming challenge, put Cubetto on the included playmat. With squares spaced to the precise size of each of the programmed movements (so one forward token will move Cubetto onto the next square) you can play some fun coding games. Either follow the story in the included booklet, of just make up your own, such as 'get to the castle, kids! ', leaving them to figure out what pieces to place to get Cubetto there. The pieces included are actually really easy to get a feel for. There are green 'forwards', red 'rights', yellow 'lefts' and blue 'functions'. This is where it can get very clever. For example, if you need to get Cubetto to the other side of the mat, but you only have four of each direction commands, you need to start thinking about subroutines. 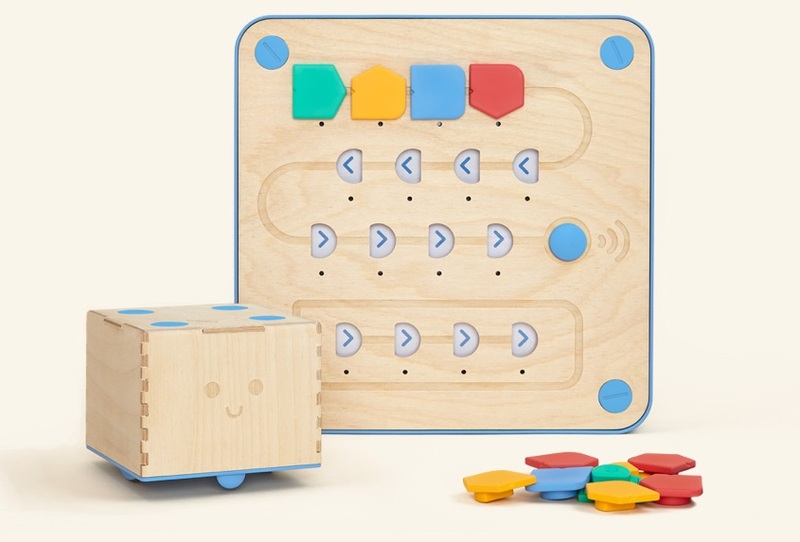 Buy creating a small chain of commands in the four-slot function box at the bottom of the control board, you can use the blue functions pieces to make Cubetto repeat that sequence whenever. So filling the function line with four forward pieces, then setting down all four of the function tokens in the main command chain, means Cubetto will move forward 16 spaces. Getting the kids to think about this not-entirely linear way programming makes the game trickier and more challenging. Once those commands are understood, the world is your oyster. We challenged our kids to navigate as much as possible around the map, asking them to visit certain squares on the way to their destination, and they loved it. So much about the Cubetto set up feels familiar, from the chunky plastic blocks to the wooden control board; it feels like a well made toy and there was nothing strange about it to the children. They just started playing, got the hang of it, and enjoyed themselves. 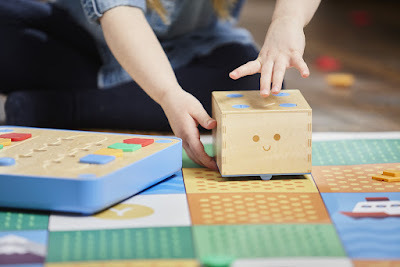 Whether of not Cubetto has sparked in interest in (or even an understanding of) coding, we can't yet tell. But it has definitely instilled in them an awareness of forward-thinking and planning to achieve a desire result. Which is what coding is all about.